This PDF 1.5 document has been generated by Microsoft® Word 2010, and has been sent on pdf-archive.com on 17/10/2016 at 19:11, from IP address 63.138.x.x. The current document download page has been viewed 251 times. File size: 239 KB (2 pages). named the HS Coach of the Week presented by @InovaHealth! 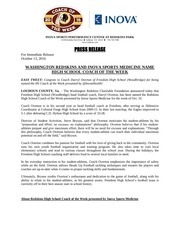 High School Coach of the Week presented by Inova Sports Medicine for the week of Oct. 10. 5-1 after defeating C.D. Hylton High School by a score of 33-28.
potential on and off the field,” said Bryson. Freedom High School coaching staff delivers food to several local families in need. coaches are up-to-date when it comes to proper tackling skills and fundamentals. currently off to their best season start in school history. 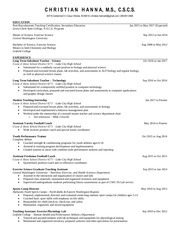 programs, the health and safety of their players, and who make a difference in their communities. from the Redskins Charitable Foundation and Inova Sports Medicine. Twitter at @RedskinsCR or on Instagram @redskinsgiveback. www.redskins.com/community or follow the Foundation on twitter at @RedskinsCR. the specific injuries and goals for recovery of each patient. since 1999, and beginning in 1997, began playing their home games at FedExField in Landover, Md. This file has been shared by a user of PDF Archive. Document ID: 00495403.